It turns out that roundabouts may be part of the panacea for our greatest traffic woes. Across America, towns and cities of all shapes and sizes have been choosing modern roundabouts over antiquated signalization equipment and expensive grade separated interchanges. The choice of a roundabout, or a modern roundabout, rather, makes sense for several reasons: they have proven to improve the flow of traffic, reduce cost, improve safety, and enhance the quality of place. The idea of a “one-way rotary system” was first proposed in 1903 for Columbus Circle in New York City by William Phelps Eno, "the father of traffic control." The Columbus Circle roundabout was built in 1905, and the idea quickly caught on in Western Europe. The first modern roundabouts in the US were installed in Nevada in 1990; but it has been a slow progression, after 104 years we only have about 1000 modern roundabouts in the entire country. France, on the other hand, leads the world with an estimated 15,000 modern roundabouts, and has been building them at a rate of about 1,000 per year. One of the most touted benefits of modern roundabouts is their ability to improve traffic flow. Studies by Kansas State University have measured traffic flow at intersections before and after conversion to roundabouts. In each case, installing a roundabout led to a 20 percent reduction in delays. The proportion of vehicles that had to stop – just long enough for a gap in traffic – was also reduced. Because of their ability to reduce congestion, the Department of Transportation (DOT) of New York, Arizona, Wisconsin, Washington State, and Oregon, are at some point in the process of developing a modern roundabout program. It may seem counter-intuitive, but modern roundabouts can actually improve safety while improving the flow of traffic. In March 2000, a report was published by the Insurance Institute for Highway Safety entitled A Study of Crash Reductions Following Installation of Roundabouts in the United States, which demonstrated that roundabouts reduce crashes by 75 percent at intersections where stop signs or automated signals were previously used for traffic control. According to the Washington State Department of Transportation (WSDOT), there are several reasons why roundabouts are safe: 1) Low travel speeds – because drivers must yield to traffic before entering a roundabout, they naturally slow down, 2) no red lights to run – roundabouts are designed to keep traffic flowing without requiring vehicles to stop, so the incentive for drivers to speed up to make it through a yellow or red light is removed, and 3) less potential for serious crashes – since vehicles all travel around the center island in the same direction, head-on and left-hand turn (T-bone) collisions are eliminated. Congestion and safety are often discussed, but what’s not often discussed is the ability of modern roundabouts to greatly improve public space. Increased safety promotes biking and walking, which increases the vibrancy of the place, activates the street, and has several other multiplier effects that can create a destination. Therefore, roundabouts can play important roles in creating a destination, not just an area people drive through. In many instances, the roundabout itself can become a place. By adding a sculpture, water feature, benches, or other architectural feature that will attract attention, the roundabout can become a community focal point and even a gathering space. When you’re giving directions, meeting friends after work, or walking your dog, you may find yourself heading towards the roundabout. Now, how often have you walked your dog to the grade separated interchange? Traditional intersections can serve as points of identification for a community, but they do not add to the sense of place. They are often dangerous places that are to be avoided. Modern roundabouts, however, afford opportunities for streets to be places, and allow the community to reclaim intersections as community space. 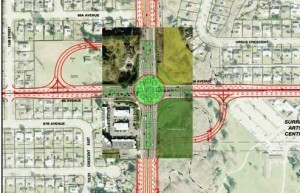 Below is an image of a Michael Wallwork designed roundabout that PPS proposed for a project in British Columbia. The image is an overlay of our roundabout proposal, on top of a traditional “jug handle” design, which proposes long and wide on and off-ramps. As you can see, the roundabout preserves a significant amount more land than the alternative design. The land preserved by the roundabout includes a park, residential development, and a community arts center; all very important community assets that would be severely compromised if the jug handle were built. Several areas in the US have fully embraced the modern roundabout. Vail, Colorado was the first; they built a series of 5 roundabouts that eliminated 37 stop signs in the Vail Valley. But it’s the town of Carmel, Indiana that wins the title for implementing the most successful roundabout program. The suburb of Indianapolis has built over 40 modern roundabouts, with several more proposed. Here is a short video of the Mayor of Carmel presenting the town’s roundabout program. I’ve also included several other links where you can find the roundabout information referenced above.